Lavrenti Behria, head of Stalin’s secret police. There’s a reason why legal proceedings, both civil and criminal (with a very few exceptions such as for murder), are subject to statutes of limitations, meaning that such court proceedings must be initiated within a prescribed and limited time frame. The reason is because as time passes, evidence disappears or is no longer attainable; people’s memories of events fade and become unreliable; witnesses move away, becoming impossible to find, or they simply die off. Further, in our legal system the burden of proving the offense, criminal or civil, lies with the accuser—the prosecutor or plaintiff. The defendant doesn’t have to prove his innocence; he enjoys a presumption of legal innocence that must be overcome. But we seem to have entered an era that proves why there’s an actual need for statutes of limitations. This is an era of hysterical accusation, as typified by the #MeToo movement, in which any allegation of impropriety at any time in a person’s past has the potential of destroying that person’s life without benefit of the protections of any legal proceeding at all. It’s mob-sanctioned character assassination and personal destruction. 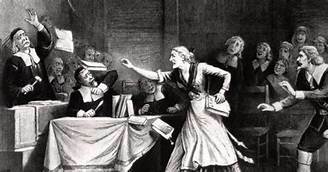 This is reminiscent of the Salem Witch Trials, in which completely fabricated and fantastical accusations by hysterical teenagers was enough to condemn women to death unless they could prove their innocence of the accusations, an impossibility. Basically, a lynch mob. We saw something similar in the 1980s when a completely unfounded hysteria swept the nation about children in preschools being subjected to satanic rituals, including human sacrifices, all of which led to the infamous McMartin Pre-School trials, in which the defendants were ultimately exonerated and the nature of the hysteria finally understood. The latest iteration of this phenomenon is Senator Dianne Feinstein’s incredibly cynical and despicable act of accusing Judge Brett Kavanaugh of committing the criminal act of sexual assault well over 30 years ago while he was in high school, an accusation she leveled during the last day of the committee hearings concerning his appointment as a Justice to the Supreme Court. If she knew about this claim for months, as she’s said, why did she wait so long to bring it to light? If this is anything other than a Hail Mary attempt to derail the confirmation process, why didn’t she raise the matter much earlier, when it could have been addressed in an orderly fashion? Why, after examining the “evidence”, did the FBI decide not to pursue the matter? Why did the alleged “victim” wait literally decades before telling anyone about this assault? Why didn’t she report it to the cops at the time, or at least her parents? She claims Kavanaugh was drunk. How do we know it wasn’t she who was actually drunk, this whole thing being just a figment of her fevered imagination? Both Kavanagh and his friend – who would be an “accomplice” to this “crime” – have stated that the incident never happened. Why shouldn’t we believe them? How does Kavanaugh prove something didn’t happen over 30 years ago? Why should he have to, since that flies against all the foundational precepts of our justice system? Scores of his high school contemporaries have stated that they don’t believe the accusation, and that it doesn’t conform with his personality. Why should anyone believe the sole accusing “victim” over all the others who have made statements about the matter? As I said, this is why we have statutes of limitations; so we don’t have a “show me the man and I’ll show you the crime” society. Think about it. How would you like to wake up one morning and find out that some kid you went to high school with three decades ago has, out of the clear blue sky, falsely accused you of committing a major felony all those years ago? And that to top it off they were making the accusation to local reporters, maybe right here in The Signal for example, so that all your friends and neighbors, relatives and business associates, would have that accusation staring them in the face over their morning coffee. Well, that’s exactly what happened to Brett Kavanaugh thanks to the shameless manipulations of Feinstein. This is the closing run of the Dem/socialist clown car that they’ve driven through this whole confirmation process. I thought Kamala Harris and Cory “Spartacus” Booker were absurd, but Feinstein’s managed to take the cake with this. Remember this when it comes time to vote on November 6th.